He kicked the air in frustration far harder than he had the ball. Danny Ward knew full well what he had done. Or hadn’t done. Five months ago, he had won Rotherham United their only away point in a season about to end in Championship relegation. At Molineux, the striker cost them the chance of more. Twice in the first half he was through one on one with the Wolves goalkeeper and twice he came off second best against Carl Ikeme who didn’t have to do much more than pick up tame efforts hit straight at him. The Millers would go on to concede just before half-time and set a new mark for defeats in a single season. With nine games remaining, the division’s bottom club are 21 points from safety and the drop could be mathematically confirmed after two more matches. At Ipswich in October, when he scored twice in a 2-2 draw, Ward had been so unplayable his teammate, Richard Wood, had labelled his display “a joke”. No-one was laughing here, least of all the centre-forward who was scoring at the rate of a goal every other game at the start of the campaign but has failed to register in his last 11 league outings. Caretaker manager Paul Warne, whose side deserved something against a team with their own survival worries, described his top scorer as “devastated”. Had Semi Ajayai done it in his own six-yard box, it would have been one of the clearances of the season. But the Rotherham centre-half, who has been so good since his January loan switch from Cardiff City, was only a few feet from the opposition goalline in time added on when he somehow lifted the ball over an empty net. Will Vaulks crossed from the right, substitute striker Jerry Yates produced a lovely flick and a defender diverted the ball straight into Ajayi’s path. A second later, it was in the home kop. “I thought we were the better team,” Warne said. “I told them that there were 10 cup finals left and go out and prove to people that they can compete at this level. Ward should have had the Millers in front by converting either or both of his 10th-minute and 21st-minute opportunities, created by Tom Adeyemi passes, before Rotherham goalkeeper Lewis Price saved a 35th-minute penalty from Helder Costa following a harsh spot-kick award against Joe Mattock when he and Costa tumbled together. Andi Weimann, working himself on to the wrong side of Ajayi from Ben Marshall’s pass, rounded Price to score and, not for the first time this season, the Millers had been hit by a hammer-blow on the stroke of half-time. After the break, they traded a Yates header just over against Wolves shots by Costa (saved) and Jon Dadi Bodvarsson (off target) and it was the visitors who were applying most of the pressure as the clock ticked down. Then came Ajayi’s big moment. Like Ward, he knew what he had done. Or hadn’t done. He turned immediately and ran back to his own half, eager to flee the scene of the crime. This doesn’t make good reading, so let’s get it over with quickly. The defeat was a club-record 28th in a season consisting of 46 fixtures and matches the worst ever tally by a Rotherham side, set in the 1924/25 campaign when there were 42 games. It exceeds by one the number of losses in 2004/05, the last time the Millers were relegated from the second tier. 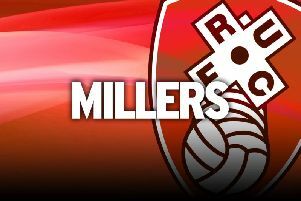 An 18th away reverse equals a Rotherham team’s worst ever total of defeats on the road, set in 1924/25 and repeated in 1932/33, which were both 42-match seasons. Warne was so angry when Vaulks was left lying prone on the turf by a late, yellow-card challenge by Weimann that he had to be calmed down in his technical area. Vaulks, playing and impressing for the third time in a row at right-back after spending most of his first Millers season in midfield, just dusted himself down and carried on. He’s a tough, determined competitor, and the role of full-back, where he has more space to use his quality on the ball and more time to weigh up his options, suits him. If he continues in this form, he will soon be a right-back who used to play in midfield rather than a midfield man filling in in defence. Next year, a division lower, he could be a real asset. League One is just around the corner and, in some ways, can’t come soon enough as a season of spirit-sapping struggle exacts its wearying toll.